The research activities within IEHK (Institut für Eisenhüttenkunde) involve the major topics of materials characterization, advanced computer simulation of materials, materials processing, and fracture mechanics. The ultimate aim is to understand the mechanisms behind the physical, mechanical, and microstructural properties of steels, to be able to improve their macroscopic behaviour through transformations and variations of the microscopic phases and to design advanced solutions for steel production, processing and application. 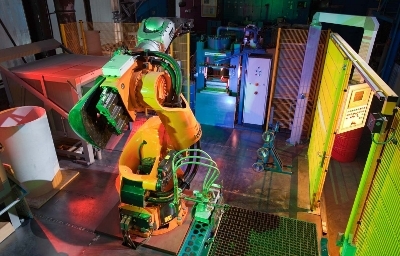 The scientific approach of the institute is to use a combination of different mechanical and physical testing methods with advanced numerical approaches in order to investigate the bulk properties of different iron-based alloys at sub-zero temperatures as well as room and elevated temperatures. Using a suitable combination of microstructural design, process optimization, and mechanical testing, it becomes possible to introduce more efficient process parameters, innovative appli-cations, and new materials. The simulation work focuses on the integrative numerical modelling of the evolution of microstructures during processing on different scales. The objectives are to combine physical and phenome-nological approaches, to evaluate modelling approaches, to describe processes and process chains by numerical means, and to predict the evolution of microstructures and properties by using combined thermodynamical and FEM calculations of representative volume elements (RVE) on the microstructural scale. By means of simulation it is aimed to develop materials and processes, to design and to optimise production parameters, and to predict materials behaviour in relation to the microstructural description. Modern commercial thermodynamic tools are used like ThermoCalc®, DICTRA®, MatCalc® and MICRESS® and are linked with empirically based approaches as well as with FE tools like ABAQUS® and SysWeld®.